The cell component press is a tool for safely ejecting the parts of an AUC cell from the cell housing. In some cases cell components can become stuck in the cell housing and can be extremely difficult to remove. The cell component press can be used to remove these stuck components. The shaft of the component press is moved up and down with a handle on the right side of the tool. 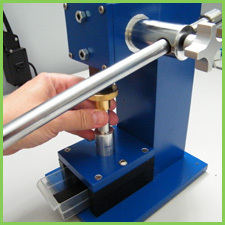 The shaft presses on an aluminum plunger with a brass handle that is held by the operator while rotating the shaft handle. The plunger can also be used as a stand alone tool to gently press components out of a cell housing with the palm of your hand. The component press shaft also has a steel stop collar at the top of the shaft which should not be removed. This stop prevents the shaft from pressing down too far and so protects the cell housing from being damaged. Remove the fill hole screws and gaskets from the cell housing. Using a torque stand remove the screw ring from the top of the housing. Use a dental pick to remove the screw ring gasket from the top of the housing stack. Place the cell housing into the holder on the cell component press with the bottom of the housing facing up. Place the aluminum shaft of the plunger into the bottom hole in the housing. The plunger will press against the surface of the aluminum bottom window holder. Holding the plunger in place with one hand, lower the shaft of the press by pulling the press handle toward the front of the tool. The shaft will contact the brass handle at the top of the plunger. Continue to press down on the press handle to eject the cell components into the foam lined drawer at the base of the component press. CAUTION: Hold the plunger by the outside edge of the brass handle so your fingers don’t get pinched by the component press shaft. The component press can exert strong forces down on the plunger. It is possible to damage/destroy the cell components if excessive force is applied. If the component press is not secured to the bench with the screws provided, it is possible that the tool could tip over when force is applied to the shaft handle.